Flipkart Offering Flat Rs 9,501 OFF on LG 32inch HD Ready LED Smart TV as per LG it is the India's Only TV that comes with WebOS 3.0. 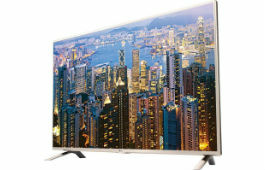 Buy LG 32inch HD Ready LED Smart TV Worth Rs 34,500 For Rs 24,999 Only from Flipkart. WiFi Alliance-certified Miracast provide wireless connecting with TV, smart phones, and tablets, allowing you to share your digital content right on the TV screen. Intel WiDi (Wireless Display) technology provides easy and fast connections between LG TVs and laptop PCs without requiring a network or messy cables. LG TV comes with flexible wall mount brackets which lets you rotate the TV as per your viewing angle requirement. Number of directions in which the TV can be moved after wall mounting vary from model to model.